The cottage is an attached wing of the 18th Century, Grade 2 listed manor house (Enford House) and is a home away from home with comfortable beds, good quality bedlinen and towels, TV's in every bedroom, a well equipped kitchen as well as WiFi and a games room with Table Tennis, Pool Table and Table Football. 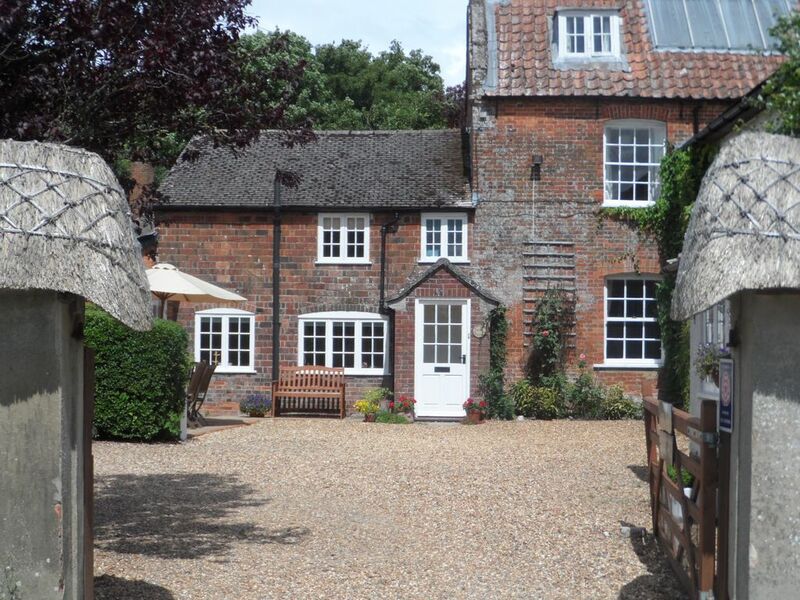 The property is surrounded by the wall garden which is situated next to the village church and beyond that fields. The village pub, which serves good food and has just won Wiltshire's 'pub of the year', is 2 minutes walk away. The cottage is child friendly - the garden is enclosed by the wall and there is a thatched games room for visitors to use with table tennis and table football and also a swing and slide in the garden and also a football goal. Wifi is available throughout the property. There are 3 ensuite bedrooms, 2 double bedrooms situated upstairs and a twin bedroom situated downstairs next to the sitting room. The garden is completely enclosed and the entrance gate can be shut for those with young children or dogs. The village of Enford is in the Avon Valley - the village is surrounded by countryside and there are lots of places to walk or bicycle. Stonehenge is an hours walk or 10 min drive. The village has 2 great local pubs. The Swan, which is 2 minutes' walk, and The Red Lion, in the next door village of East Chisenbury, which is 2 minutes' drive or a 20 minute walk. Both do good food - the Red Lion has a Michelin pub award for its food and is a well known Wiltshire pub which people come a long way to visit. There is no shop in the village itself but there are local shops in neighbouring villages less than 5 minutes drive away, major supermarkets in the local towns and all the supermarkets do delivery to the door. And for those looking for a winter get away the cottage is very warm with central heating throughout, an electric log burner in the sitting room and double glazing so is very cosy! Simon and Mary Campbell, who own Enford House Cottage, live in the main house next door with their children. The picture shows the main part of the house in which they live. The cottage and main house have seperate entrances it feels very seperate although we are attached at the back. There is a trampoline and Swing and slide in the garden which all guests are welcome to use. With the thatched walled garden and special door in the wall to take you through to the churchyard Enford is a very special place. The cottage has a lovely feeling about it and everyone comments on how comfortable the beds are! The cottage is lovely, it is cosy and really well equipped and furnished. The garden is fab and was fully secure for our dogs. Not five stars because it is attached and, whilst I knew that and thought it would be OK based on other reviews, we wanted a week away from people and noise and at times it was just not peaceful enough for us. The owners are very discrete and we hardly saw them but there were a lot of people coming and going (cars, cleaners, gardeners, deliveries and cold callers to us when the owners were out) and we could hear the owners moving around their own house, particularly in the mornings and evenings. The road is also very close and again, at times, quite noisy. It didn't spoil it and it was a risk we took because the cottage was otherwise perfect for our needs. Two other small things that might make the stay more comfortable - we had unseasonably good weather and would have liked to sit out in the garden on comfortable chairs and a stairgate to stop the dogs from going upstairs - we achieved it but needed to build a barricade each time we left them in the day. At night we put them in the utility but not nice to be shut up in such a small space in the day too. Glad you liked the cottage and the garden. We do provide a stairgate and it is stored in the cupboard in the main bedroom, sorry you did not find it – we could have directed you to it if asked. As you know it’s a large garden and does require help to maintain so apologies if the gardeners disturbed you at all on the 2 days they were there. As our cars were parked in the church carpark next door, as we usually do, I am not sure what other comings and goings there were while we were at work but the postman does need to deliver occassionally! The cottage has all the comforts you wish for and is totally dog friendly. Mary is a lovely host, relaxed but also attentive to needs. The Swan pub up the road has super beer and lovely food and the walks around the village are comfortable. We had beautiful weather - we have been here before - 4 yrs ago. We had a lovely time in Enford Cottage - it is very comfortable and perfectly located near the pub. I’d recommend going to Avebury and nearby West Kennet long barrow to explore. The Pewsey Downs are great to walk on and our dog had a great holiday too. The kids loved the games room with the pool and table tennis. The cottage has comfortable beds and it was nice to rent somewhere where there were a few bits and bobs in the kitchen cupboards and some loo roll and kitchen roll! Many thanks for having us all. I would highly recommend! Lovely place to stay, the owners were very accommodating and friendly. The cottage is cosy and well equipped with all and more than you would expect. Lovely White Company bedding. This extra touches make al the difference. The pub was excellent and so close. Would definitely go back. Lovely cottage to rest in after our long trip from the US. We were able to visit Bath and Stonehenge easily. The Swan (the local restaurant and pub)was warm and welcoming. Great food and at a reasonable price. The service was wonderful. The cottage was clean and well stocked with all the necessities to make our stay enjoyable. Thank you Mary for making our stay comfortable and for providing this wonderful holiday home! Amazing stay in the country. If only every place could be as fantastic as this. Great hosts, location, and cottage it truly adorable.